I might swing by to say hello and donate some troops if you'd like? I'll stay for a bit then head back. Sorry to those of you that have had to endure my ramblings in the clan since I joined!! Is 7 or 8 days later on. I never spend money on mobile games but I am considering it. Let's just get this out in the open: We are adjusting the available loot in battles. 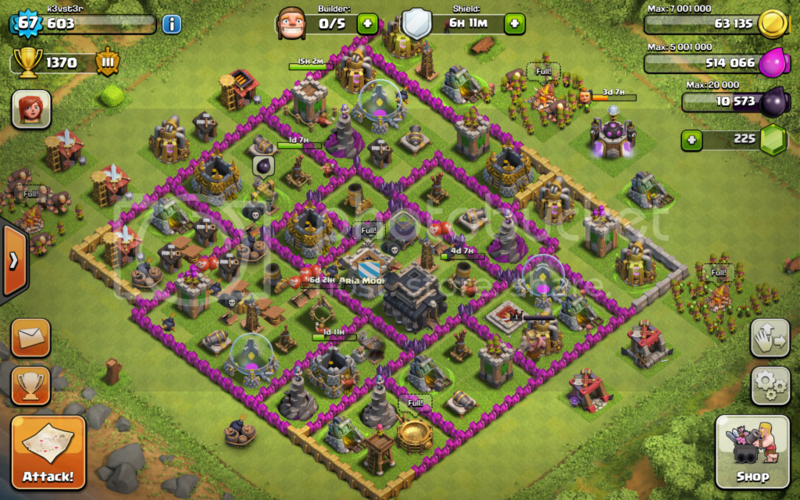 We are making it easier to save up for big upgrades and purchases based on your Town Hall level. At the same time, we are allowing for more rewarding loot opportunities in battles by increasing limits on available loot based on defender Town Hall level. If that's a good enough explanation for you, great! If not, don't worry. Read on, and we'll try to explain what this means in practice as best we can. We know that players love their loot and the Clash development team wants to be 100% transparent concerning the reasons and the exact numbers underlying this change. Be brave, Chief. The answers await you! The current loot calculation system has been in place since the early days of Clash, where Town Hall level 8 was the highest Town Hall and storages held a maximum of 6 million Gold and 6 million Elixir. Since then, we've introduced two new Town Hall levels full of new buildings, units, upgrades, added Dark Elixir, Heroes, and much, much more. However, despite all of these new things to spend your resources on, the looting system has remained more or less unchanged and, frankly, has become somewhat out of date and out of balance with the increasing costs. Common criticisms we've heard are that it becomes too hard to save up resources for a big purchases (Inferno Tower, anyone? ), that there is not enough loot in battles and that the costs of maintaining an epic base and mighty army are too burdensome for even the most industrious of Chiefs. Put a simpler way, the further one goes in Clash, the slower and more expensive it gets, until some players reach a point where it can feel like they are stuck (or at least moving in slow motion). How is available loot calculated? 1) A defender who gets raided never loses everything. 2) An attacker can only steal a limited amount of loot. Let's say you are sitting on 1 million gold in your storages, but... Oh no, here come the goblins and you get completely wiped out! However, because "a defender who gets raided never loses everything," you don't lose all 1 million gold. Instead, you only lose 200k, which is 20% of your total. Another way we can say this is that there is a defensive loot percentage of 20%. The defensive loot percentage and defensive loot cap are the key concepts that determine available loot, and we have to keep them in a careful balance. The lower the loot percentage and loot cap, the easier it is to hold on to your savings, but the harder it is to get more resources through attacking. Why change the loot percentage and loot cap? Face it, Chief, Level 6 troops, X-Bows, Inferno Towers and Level 11 defensive upgrades do not come cheap. Of course, it is natural that better and better items come with higher price tags, but with a loot system tuned only up to Town Hall level 8, how will you meet these rising costs? Two things would clearly help: making it easier to save up loot and winning more loot in your attacks. Furthermore, the higher your Town Hall level, the more you need to save and the more you need to loot to keep up with expenses. By changing the way the loot percentage works, we can better enable saving up loot. By changing the way the loot cap works, we can better enable diverse and rewarding loot opportunities in battle. What are the exact changes? We are changing the available loot so that, when a village gets wiped out, the defender loses a lower percentage of everything they have, but the attacker is able to steal more of it in total, based on the defender's Town Hall level. If you're thinking, "That's no fair! TH10's will have it so easy!" hold on. You didn't let us finish. Won't this mean lower level players will be picked on more? Not at all. In fact, we are hoping for exactly the opposite. Currently, most players at Town Hall level 7 and above constantly see available loot hovering around a cap of 200k Gold and 200k Elixir. It is always that same boring 200k, no matter if they are at Town Hall level 7 trying to buy their first Hidden Tesla, or if they are at Town Hall level 10 trying to buy their first Inferno Tower. After these adjustments, higher level opponents can provide much better loot opportunities (up to a cap of 400k). We are hoping that these better loot opportunities will incentivize all players at Town Hall 7 and above to attack other players at their level due to their higher potential loot payouts. The costs of higher level armies and spells can be better compensated by higher level opponents. At the same time, we hope that improving resource protection (down to a minimum percentage of 10%) will also reduce the hesitation and anxiety some players seem to feel when they are ready to upgrade to a higher Town Hall level, but fear that all of their looting opportunities will suddenly disappear. What about existing loot penalties? Currently, there is a loot penalty system in place that can modify the available loot based on the difference between the attacker and defender Town Hall levels. It was intended to discourage players at higher levels from picking on players at much lower levels by reducing the loot when the defender was at a lower Town Hall level, and increasing the loot when the defender was at a higher Town Hall level. However, this system is not ideal for a number of reasons and has, not unfairly, been criticized as "punishing players for progression." We feel that the loot adjustments, as described above, are a better way of encouraging fair play and rewarding high level attacks, rather than the existing loot penalty based system. Therefore, we are removing loot cap increases based on an attacker being below a defender's Town Hall level. The new system will be much simpler. Town Hall level differences are ignored when the attacker is below the defender's Town Hall level. Instead, higher town hall levels will naturally carry a higher loot cap, regardless of opponent. Keep in mind, though, that loot decreases based on an attacker being above a defender's Town Hall level will remain unchanged in order to continue to better protect lower level players. Dark Elixir loot will follow a similar guideline, but with more minor values, as Dark Elixir comes into play much later in the game. For Dark Elixir, starting at Town Hall level 9, every Town Hall upgrade will lower the loot percentage by 1% Dark Elixir and increase the loot cap by 500 Dark Elixir when you are defending. We truly expect that these adjustments to the loot calculation system will be better for all players in the long term. Even so, we will be keeping a close eye on how the loot situation in the game progresses in the weeks following the change. As storages start filling easier and loot opportunities start to expand, it may take a little while for the full effect of the changes to be felt throughout the game. Rest assured, though, that we are committed to doing what it takes to keep Clash fun, exciting and rewarding far into the future. Ha, I remember reading all that when they changed it. The old loot system was awesome. just wonder how low can I drop my trophies? I'm at 641, and the system disabled attacking for a few minutes. Last edited by superlattice09; 12-03-14, 17:14. I think theres a new hack thats getting popular lots of people with really high level townhalls but only stage 1 or 2 walls and only 2 cannons and archer tower. the only hack i've come across is one that leaves you on-line so you cant be attacked. Clan has really filled up so apologies if you get/got kicked for inactivity. Mr.X "I NEEDZ UR TRUPES!"